Old Honest History hands will recall our regular column Jauncey’s View, featuring the exploits and opinions of Leslie Cyril Jauncey (1899-1959), his wife Beatrice Eva Edmonds Fripp Jauncey (1895-1996) and other Jaunceys. Les and Bee (sometimes Bea) travelled frequently and knew more than a few people around the world and Les wrote about them and about world events, while completing three notable books, Australia’s Government Bank (1934), The Story of Conscription in Australia (1935) and Modern Banking (1949). Our Jaunceyphile researcher, Steve Flora, has continued his delving, with particular focus on why Les Jauncey was a person of interest to the FBI and possibly to ASIO in its early days. While Steve waits for a response from the FBI he has been reading through material from the Evatt Papers at Flinders University in South Australia. 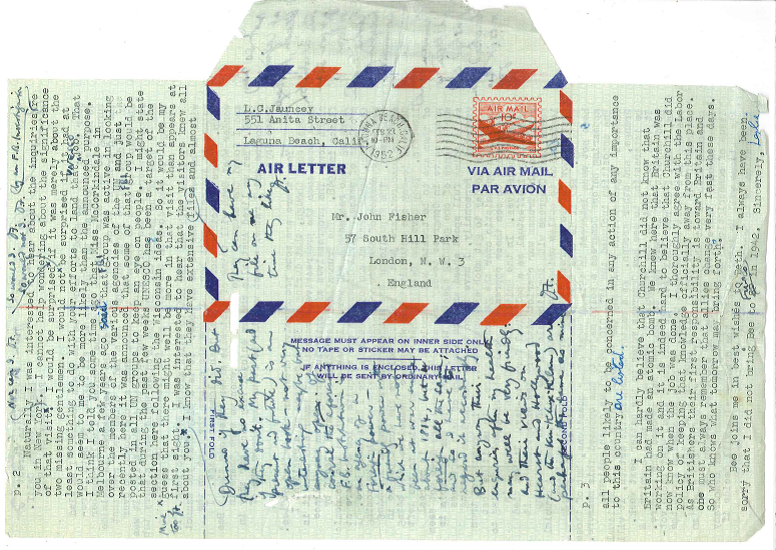 Among the Flinders material is an old fashioned ‘air letter’ sent by Jauncey to John Fisher, communist journalist and son of Prime Minister Andrew Fisher, who (in turn) forwarded it to HV Evatt, Leader of the Labor Opposition. The air letter is dated 27 February 1952 and was sent from 551 Anita Street, Laguna Beach, California. It is marked ‘Personal Dr. Evatt from Dr. Leslie C. Jauncey’ with the same pen as the handwritten notes by ‘J.F.’ throughout the text, both making it clear the letter was forwarded by John Fisher for Evatt’s information. It is not known at this point if Jauncey was aware of the forwarding, just as there is no evidence that Evatt read the air letter, although it is in his papers. [The air letter] is interesting [says Steve Flora] for both its history and the time when it was written and with what was going on both in Australia (particularly with Evatt, leader of the Labor Party by now) at the time AND with the references to FBI investigations. So the FBI was apparently looking into John Fisher in New York. This would have been during the time L.C. Jauncey was being investigated by the FBI as well (I wonder if he was aware of it?). After some chatty opening remarks, Jauncey goes on to discuss the state of the progressive forces in the United States. I must say, though, that during my 32 years here as a resident I have never seen the progressive movement at a lower ebb than it is right now … The Truman Administration has saved itself by plunging into rearmament and war. It has no answer to the economic problems of peace. Civil liberties are at quite a low ebb here at this time, lower than at any other time since I have been here … The war hysteria is still going full steam ahead and the campaign of hate continues unabated. Jauncey regards the Democrats in the United States Congress as just as bad as the Republicans and he is scathing about so-called ‘liberals’ (‘progressives’ in the US). Election prospects in 1952 are dim for progressives, he believes. Jauncey (and Fisher’s annotations) then speculate about whether and to what extent the two of them are being investigated by the FBI. Jauncey concludes with some thoughts about the development of the atomic bomb in Britain. I can hardly believe that Churchill did not know that Britain had made an atomic bomb. We knew here that Britain was working on it and it is indeed hard to believe that Churchill did [not] know when the job was done. I thoroughly agree with the Labor policy of keeping that knowledge officially away from this place. As Britishers their first responsibility is toward Britain and one must always remember that allies change very fast these days. So who knows what tomorrow may bring forth? At the beginning of the letter Jauncey had noted that Fisher’s wife Beth was to visit Australia. He recalled he and Bee had enjoyed their stay in Australia in 1948-49. After visiting Auckland and Christchurch in New Zealand, the couple had come to Sydney early in June 1948 then stayed in Queanbeyan for a few days, visiting Canberra, then on to Albury and Melbourne. They remained in Australia until December 1949. Their period in Australia included the height of the struggle over the Chifley Government’s plans to nationalise the trading banks. Jauncey was mentioned in an article in the Hobart Mercury of 20 November 1948, which speculated about who might succeed the retiring HT Armitage as governor of the Commonwealth Bank, though there is no evidence Jauncey was being seriously considered as a contender. By May 1949 Jauncey was being quoted at length in the Adelaide News about the prospects for depression and war. He felt the danger of war was receding (after the scare during the Berlin blockade and airlift) but the United States appeared to be sliding into a depression, partly because of the inability of the banking system there to regulate the economy. Les Jauncey returned to California where he lived for another decade in increasingly poor health. His 1952 letter to Fisher shows, however, that he retained his interest in events. He wrote to Evatt at least twice more, later in 1952 and in 1958. Sources: Jauncey, Leslie (1952 February 27). [Letter to John Fisher, Passed by John Fisher (JF) to HV Evatt]. Evatt Collection, Flinders University Library (Identifier: Evatt/File/Fisher, John). O’Malley Papers, National Library of Australia.